2. Date For Your Diary Around the Cir­cuit /Ar­ticles/404524/Cairnshill_Met­ho­dist_Church/About..
3. GB 20172018 Sea­son. /Ar­ticles/355610/Cairnshill_Met­ho­dist_Church/Missi..
4. BallynafeighCir­cuit Prea­ching Plan /Ar­ticles/404520/Cairnshill_Met­ho­dist_Church/About..
5. 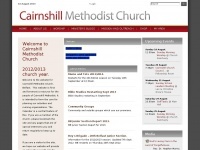 Cairnshill Ju­nior Section Boys Briga­de /Ar­ticles/413581/Cairnshill_Met­ho­dist_Church/Missi.. The web server with the IP-address 85.13.213.3 used by Cairnshillmethodist.org is owned by Coreix Ltd and is located in London, Great Britain. There are many websites run by this web server. The operator uses this server for many hosting clients. In total there are at least 174 websites on this server. The language of these websites is mostly english. The content management system DotNetNuke is used. The markup language of the website is HTML 4.0 Transitional. The website does not specify details about the inclusion of its content in search engines. For this reason the content will be included by search engines.